Tossing It Out Tossing It Out: We've Had a Roast and Now a Toast! Thank You for the CheerFest Fun! Monday's Cheersfest was a great time and I want to thank all of you who turned up with posts and to those who left equally fun comments. I hope everyone had as much fun as I did. The whole event made me feel all warm and roasty. 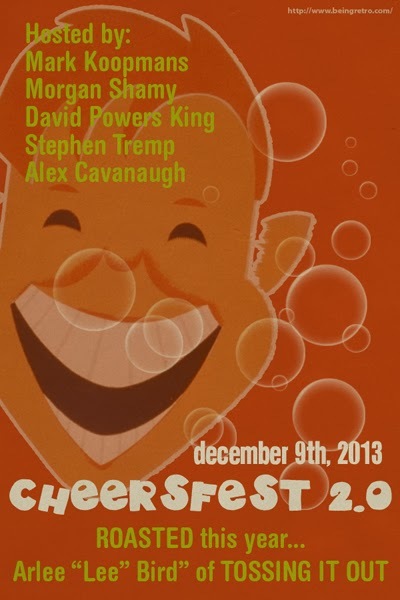 A special thank you to the Cheersfest hosts Mark Koopmans, Morgan Shamy, David Powers King, Stephen Tremp and Alex J. Cavanaugh. This year I had about a quarter of the roasters that Alex had last year which actually was kind of a blessing to me. It's going to be tough enough to judge the best roast entry out of those who put me on the spit. I don't know how Alex managed last year, but I never know how Alex manages to do what he does. I still say clones. There were plenty of commenters to make up for the lack of official entries. It's a good thing I don't have to include them in the contest. I'd be sweating over the decision for days to come. I'll be announcing the winner next Monday--a day with more than one special announcement. I'll also have a special Ask Arlee follow-up post next Wednesday in response to Sydney Aaliyah's request that I roast myself and answer the questions. That's when the truths will be revealed! 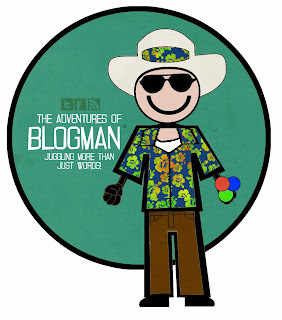 Many comments were made about my new cute logo BlogMan guy. When I first laid eyes on him I had a nice laugh and I still beam every time I see him. My very special thanks to Jeremy Hawkins at Being Retro for designing the little fellow. Additional thanks to Mark Koopmans for turning my thoughts into contacting Jeremy about this. I think Jeremy did an amazing job. Many of you are already familiar with Jeremy Hawkins as one of the A to Z Challenge co-hosts for the past few years. He designed the official Challenge badges for 2012 and 2013 plus many other banners and badges associated with the Challenge. He also did much of the work on the A to Z Blog page. He is a quiet behind the scenes guy who has played an important role in adding to the success of the annual A to Z Challenge. But Jeremy's influence in the blogging community extends far beyond this. The header to Tossing It Out was a custom design by Jeremy. And that very cool animated header as well as other artwork on Alex J Cavanaugh's blog was also created by Jeremy. Some of you have Jeremy's artwork on your own blogs and rather than me just listing through them I'll let you tell about what he's done for your blog or other artwork he's done for you. A talented artist, graphic designer, ideator and renaissance man, Jeremy is a multifaceted dynamo who also designs book cover art, t-shirts, and promotional specialities. He even has his own art related books that you should check out. After all Christmas is coming and there may be that unique gift for someone on your Christmas list. If you have a Cheersfest entry you definitely want to visit Jeremy's site in case you are the winner of the prize he is offering to one of my chosen favorite roast posts. Jeremy is going to be designing a personal graphic for one of you lucky folks. Visit his blog and other sites so you can start dreaming about what you'd like to see him design for you. Maybe you can have your own character logo like my BlogMan. Or a new blog header? The winner will be announced on Monday December 16th. So I hereby propose a toast to my friend and talented artist/blogger, Jeremy Hawkins! Thanks for everything my friend and may we have an ongoing friendship for many years to come! Be watching for a special announcement next Monday from Jeremy Hawkins, Yolanda Renèe, Alex J. Cavanaugh and me. We've got something planned that you may find very helpful and fun. Has Jeremy designed anything for you or for your blog? Tell us about it in the comments and provide links if you have them. Star Trek Christmas Gifts, IWSG Update, CheersFest 2.0, and Ninja News! Hi Lee .. the roasting has been fun - with the juggling turkey wings to wondering how to stop juggling if you're on your own .. just keep on with the flaming turkey wings. I love Jeremy's badge .. it's completely right - very clever of him .. This man deserves a lot of praise, he's done a great job. The roast was so funny Lee, especially A Beer For The Shower's post, Robyn's was brilliant too though! The roast was great! You know who your real friends are after something like that. Clones may or may not be involved. But yeah, it was tough last year with so many entries. Jeremy is amazing. Even when the dude is swamped, he still has time to do things for his friends. My banner is beyond awesome, and he even redid it when my third book came out to include the ship on CassaStorm. And buy his shirts, people! They are awesome. We have enough at our house to do a fashion show. The entries for Cheersfest were funny. I was on break in November, so by the time I heard about it, I didn't have an opportunity to come up with an entry. Jeremy does really nice work. And I don't know how Alex does it. Ahhh, Lee, I am so sorry I missed your roast fest. I was not well at all Monday and didn't even turn on my computer. Sounds like everyone had a good laugh. I'll have to go back and read all the roasts and comments. You so deserve this honor. Bask in it, my friend. Hilary - I'll keep looking for the "Brown Jacket", but alas I'm sure it's probably in not so good of shape if it is to be found. Yeamie -- There were some great roast posts. Alex -- I'm so glad to have Jeremy on our side. He's a good guy to know. L. Diane -- Actually Alex may not be a person, but a corporation with many employees. Karen -- I almost didn't make my own roast as I was knocked out with some strange ailment in the days prior to Monday. I'll be back to see what's happening on the Monday. I'm sure it will be interesting with those minds involved. Jeremy did an excellent job on BlogMan, and has a unique talent for designing all of his creations! The lucky winner's blog will definitely get a lift from whatever Jeremy comes up with! Lee, your roast was lots of fun, and I'm glad that you were such a good sport! Here, here to Jeremy! So glad you enjoyed the roast so much, Lee! You were a fun roastee this year Lee. I'm glad there are so many chance of prizes for all who entered. No matter the number of entries, all who posted made the effort to give all readers a fun time. Blog Man looks great and his designer is a true talent. Cheersfest was fantastic. I'm still reading the entries today. Jeremy sounds like a dynamo. I look forward to the news on Monday. Ah that's it Lee, you have the answer, a corporation of people represented as Alex J. Cavenaugh. Never thought of that. Not clones at all (but then there is the cloning machine which the dwarves got hold of} hmm, a mystery. Cue for one of you writers, the Mystery of Alex J.
I tried juggling once, sinlaw does it, I was not very good. Robin -- Now I'm craving turkey and dressing. DG -- We hope we'll get a lot of folks interested in what we've got planned. Julie -- Somebody's gonna get some cool art. MJ-- Hope Jeremy gets some support for what he does. Sheena-kay -- Wish I had some books to give away! Someday I'll get something out there. Medeia -- Jeremy is a very talented guy. Jo -- I was not very good at juggling either I must confess. thank you lee for the shout out, i have never been toasted... i have been burned, wink. i am glad i was able to help make your day of the blogman a little more special. you have many friends and fans, i too am one of them. I do not envy your having to pick. You don't have to worry about picking us, though, since we disqualified ourselves by not following the rules. We just did it for the fun of it, anyway. Jeremy's a great artist, and if I could design stuff even as half as well as he does, I'd feel pretty damn accomplished! I also really like Jeremey's new blog logo ("bloggo"?). Great work! I had a ton of fun participating in your roast and reading all the other entries. Sydney is a genius for coming up with the idea to have you answer the questions - I can't wait for that. 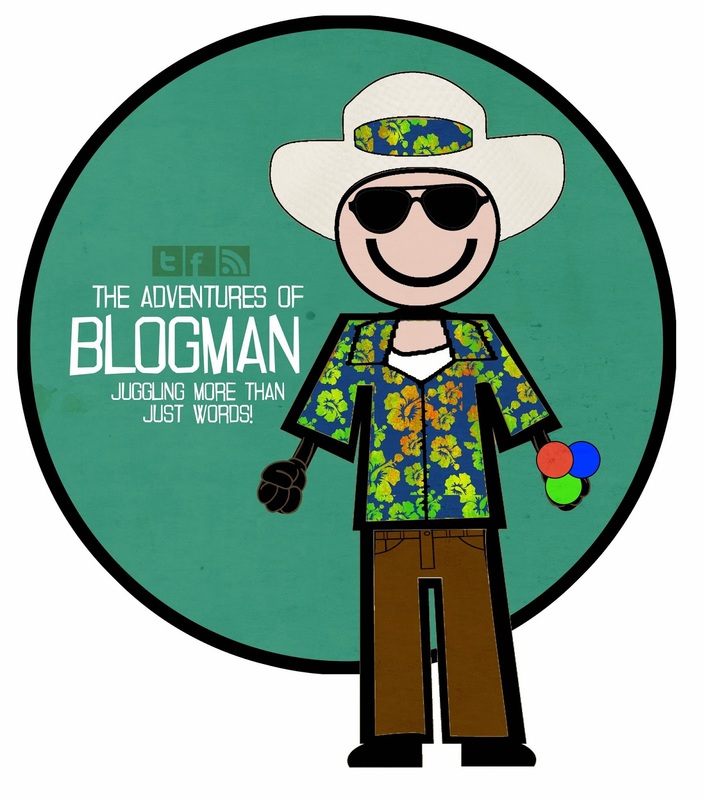 I love the blogman logo - Jeremy is very talented and I'm going to go check out his site right now. Jeremy -- Thank you for everything. Hope we can have a toast and down a few in person some day. Beer-- You all have your own special talent. What you did for the roast was pretty darn clever. Chris --"Bloggo"-- that's a good one. Kimberly -- I hope everyone visits Jeremy and passes the word on to others. Sue-- Glad you'll be joining us. Mark-- But if I recall correctly you were the one who suggested we come up with an iconic BlogMan figure. A new nickname already! Alex will soon have as many names as he has clones--not surprising I guess. Cheers to Jeremy and you Lee!! Jeremy is the go-to guy for anything art/blog related. As to what he's done for me? I also have two of his t-shirts. One is the Ninja Army, and the other "Hippie Chicks". They are really good quality shirts people, not just awesome design. GO GET SOME. It was a pleasure to roast you my dear friend. I haven't read nearly enough of the entries to guess as to who is winning, but will keep chipping away at it. Arlee, glad you had fun with the Cheerfest roast. I enjoyed reading the posts that people put up in your honor.